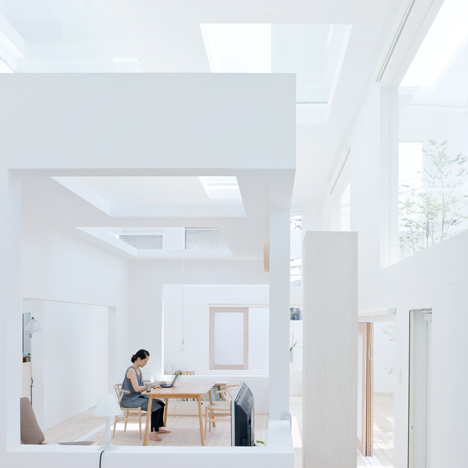 Here are some images by photographer Iwan Baan of a house by Japanese architect Sou Fujimoto, where rectangular windows puncture three layers of walls and ceilings. Located in Oita, Japan, House N was constructed in 2008 to accommodate a couple and their pet dog. Openings in the outer wall and roof aren't glazed, so the patio garden, bathroom and kitchen contained behind are open to the elements. A bedroom and tatami room are encased behind the second layer, where all window openings are infilled with glass. The innermost layer closes in around the centre of the house, wrapping around a living and dining room. See more projects by Sou Fujimoto here, including a stack of four house-shaped apartments. I have always had doubts about streets and houses being separated by a single wall, and wondered that a gradation of rich domain accompanied by various senses of distance between streets and houses might be a possibility, such as: a place inside the house that is fairly near the street; a place that is a bit far from the street, and a place far off the street, in secure privacy. That is why life in this house resembles to living among the clouds. A distinct boundary is nowhere to be found, except for a gradual change in the domain. One might say that an ideal architecture is an outdoor space that feels like the indoors and an indoor space that feels like the outdoors. In a nested structure, the inside is invariably the outside, and vice versa. My intention was to make an architecture that is not about space nor about form, but simply about expressing the riches of what are `between` houses and streets. Three nested shells eventually mean infinite nesting because the whole world is made up of infinite nesting. And here are only three of them that are given barely visible shape. I imagined that the city and the house are no different from one another in the essence, but are just different approaches to a continuum of a single subject, or different expressions of the same thing- an undulation of a primordial space where humans dwell. This is a presentation of an ultimate house in which everything from the origins of the world to a specific house is conceived together under a single method.